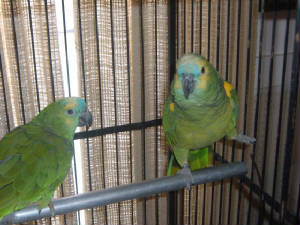 Meet "Blue and Alex" my new Blue Fronted Amazons. They are very bonded and laid unfertile last year so hopefully they will produce this year. They are said to be 6 and 7 years old.I have DNA papers on them.I am asking $700 however I may come down on price.If interested email me at: birdloverbreeder@yahoo.com and you must be able to pick them up in Whitehall, NY. I do not have a picture of this pair yet however if you are interested please email me and I will send you one.This is a pair of Conures one Sun and the other is a Sunday which they will produce Sunday Conures.They are 4 years old and are proven by previous.I am asking $600 for this pair and may come down on price.If interested email me at birdloverbreeder@yahoo.com and you must be willing to pick up in Whitehall, NY.